The northern hemisphere of Mars is marked by vast sandy plains, made up partly of red iron oxides. The jagged Valles Marineris canyon near the equator is nearly five miles deep and almost as wide as the United States. Stephen Petranek, an award-winning journalist and technology forecaster, thinks people will be living on Mars within 20 years. Petranek states his case in a new book called "How We'll Live on Mars" (Simon & Schuster/TED, 2015). Complementing Petranek's TED talk of the same name, the book paints a picture of humanity's first journey to the Red Planet, which he sets in 2027, and describes the key technologies needed to reach, survive and thrive on the planet and exactly how that process would play out. You can read an excerpt of "How We'll Live on Mars" here, courtesy of Simon & Schuster/TED. "How We'll Live on Mars," by Stephen Petranek. In a recent interview, Space.com talked with Petranek about the need for a Mars colony, the state of the space industry and his thoughts on the fictional space-survival novel "The Martian," which has been made into a movie that comes out Oct. 2. 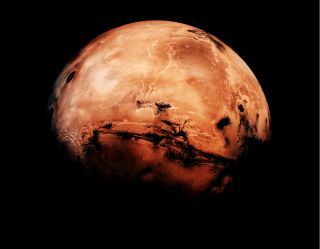 Space.com: So why should we live on Mars? Stephen Petranek: It's the best possible insurance policy for the human species. We cannot indefinitely live on this planet and survive — not only is it subject to the horrific whims of the universe, such as a gamma-ray explosion or large solar flare directed at us or an asteroid 7 or 8 miles [11 or 13 kilometers] across, but we have learned how to destroy ourselves on our own planet, both through nuclear war and by allowing the planet to degenerate into its current state. For humans to survive as a species, we must leave Earth eventually. And the sooner we start, the better. Beyond all the uncertainties, eventually our own sun will consume the planet or throw us out of orbit as it begins to die in about a billion years. We have a lot to learn; we not only have to learn how to survive on another planet in our solar system — and Mars is by far the most habitable place to go in our solar system — but eventually we're going to have to get off Mars too and go to a different solar system. Humans are going to have to move on, as they have always moved on since they originated in Africa. We are always looking over the horizon; it might be programmed into our DNA as a matter of survival. We are always looking to preserve our species, to preserve humanity's achievements over the past 2 million years. Space.com: Do you think humans are up to the challenge? Space.com: Then what changed to make now the right time? Petranek: I believe it's the entry of private companies into the space arena. Up until now, what happens in space has been the result of what governments want to do, and governments are politically motivated. But now we see the entry of private rocket companies in space: Jeff Bezos is building a significant rocket company called Blue Origin; Elon Musk in less than a decade has launched an incredible number of successful rocketsinto space through SpaceX; Paul Allen is building a space company called Stratolaunch; Eric Schmidt, Larry Page and James Cameron are backing an asteroid mining company — one of two. We're starting to see the launch into space of private interest, and that's changing everything. Especially because one of those private interests, specifically Elon Musk, is determined to get humans to Mars as an insurance policy for the long-term survival of the human species. Journalist Stephen Petranek, author of "How We'll Live on Mars," believes a Mars colony could flourish with emerging technologies. Space.com: What will be the biggest technological challenge to actually living on Mars? Petranek: The hardest technology is learning how to terraform the planet so you don't have to wear a spacesuit and live 20 feet [6 meters] underground. But I would say there's one key pivotal discovery, and that discovery, which is very recent — we first started finding out in 2008, with the Phoenix lander — is that we have confirmed there is a lot of water on Mars, especially the northern hemisphere. Water is one of the most interesting molecules there is, not just for human survival but because water is rocket fuel. It's pretty hard to light with a match, but if you separate hydrogen and oxygen … we're going to be moving into methane-fueled rockets, but for now liquid hydrogen and liquid oxygen work perfectly well. Space.com: How did you become convinced that a Mars colony would be a tangible possibility? I approached this subject with a lot of skepticism, as the media's fond of doing. And I was actually very surprised to discover in my research that it has been possible to go to Mars for 50 years. I was very surprised that you could support a significant number of people on Mars in a relatively short period of time. At the very end of doing this book, after it was all written, I sat down with Elon Musk to do a final interview. As part of that interview, I asked him about statements in the press that he expected that eventually there would be 80,000 people living on Mars. The biggest surprise of all in doing the book was his response: 'I wasn't talking about 80,000 people living on Mars — I expect millions to live on Mars within a relatively short period of time. I was trying to say that, by 2050, I would be launching a thousand rockets at Mars in a single mission, and each of those rockets would contain 80 to 100 people, and I was talking about sending 80,000 people to Mars in a single trip by 2050.' That was quite a revelation. We can do this: It's not easy to do, but it's not impossible by any means. We don't have to invent any new technology, we don't have to have any different kind of rocket engines, we don't have to have any significantly different kinds of rockets. People are not going to die on Mars like they died in Jamestown when the Europeans first came to the Americas, and there probably will be a settlement on Mars with tens of thousands of people within 35 years. Space.com: Did you run into any big reporting challenges? Petranek: All these private space companies are really private. SpaceX does not want to tell you anything. And they don't have exactly very good outreach, to say the least. Getting an interview with Elon Musk is almost impossible. Jeff Bezos' rocket company is so private that it's absolutely impenetrable by the press. Paul Allen is not forthcoming with information about what he's doing with Stratolaunch. Even Orbital Sciences, which is a fully public company, is not easy. [Orbital] has been in business since 1985, launching more than 400 rockets and resupplying the space station recently — even they are difficult to penetrate, whereas NASA is supposed to be completely transparent, and frankly is, pretty much. And everything they do is supposed to be available to the public. And it is, but it's hard to find. Because it's a sea of information, and you're just finding a molecule in the sea at a time. But by contrast, the private space companies, which I think are really going to dominate space in the near future, are very difficult to report on. They are very proprietary. So that's a huge challenge, too. Space.com: So what do you think about 'The Martian,' the novel by Andy Weir where an astronaut has to survive being stranded on Mars? However, having said that, I think there's an amazing confluence right now of interest in Mars, and I think the movie version of that book is going to promote even greater interest. The movie "Gravity," and "Interstellar" and then I think "The Martian" — each of these movies following one year after the other, have greatly accelerated the interest in Mars and in space exploration that goes way beyond the moon. And that's a very good thing. I'm quite pleased about all that. So I think "The Martian" is a huge contribution to public consciousness about humans getting off this planet. Now the other question is whether or not it's going to discourage people from going to Mars. It does clearly show what a hostile environment Mars is, and shows it as a negative. The matter of survival isn't just for the Martian to survive on Mars, but to get the heck off Mars. But I still think it increases the fascination and people's intellectual curiosity, and humans are very curious creatures. That's all to the good, because this species does not survive unless it gets off Earth. Space.com: Can your book play a role in that fascination, as well? Petranek: I am interested in getting this book into as many hands as I can, especially people like 15-year-old and 16-year-old kids in high school who are the most easily impressed. I would like to see what happened with the Apollo program happen with an interest in getting humans to Mars. Because when we got people to the moon, everyone kind of looked at each other and said, "My God, if we can do this, we can do anything." And if you get people to Mars, it will be that on steroids. It will be that by a factor of 100 because people will say, "If we can go to Mars, we can not only do anything, we can go anywhere." Email Sarah Lewin at slewin@space.com or follow her @SarahExplains. Follow us @Spacedotcom, Facebook and Google+. Original article on Space.com .